The Roses Valley is one of the different Moroccan desert regions you can visit with Berber Treasures Morocco Tours when you choose a Morocco travel itinerary that includes the fascinating Road of Thousand Kasbahs. The Roses Valley is located on the Road of A Thousand Kasbahs between Ouarzazate and Boumalne Dades, in the scenic northern most reaches of Morocco’s Sahara Desert where the desert oases meet the soaring High Atlas Mountains. The roses are just an added bonus in a region that already has so many wonderful Morocco travel highlights. 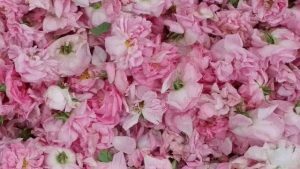 Indeed the roses grown here are of such a high quality they are prized for the oils, essences, extracts and dried flowers they yield. The rose fields radiate out from the village of el Kelaa M’Gouna, the heart of the local co-operatives that collect the harvested roses and use them to make all manner of products including: rose water used for traditional refreshing welcoming hand wash and for cooking; beauty, health and hygiene products such as perfumes, shampoos, creams, lotions and soaps; dried roses for decorative and cooking purposes; essential oils and massages oils; air fresheners and teas. . Browsing in one of the colourful little local shops offering the local roses products you will find a seemingly endless variety of rose products. You can find these shops everywhere in Kelaa M’Gouna with many clustered together in the village centre. They are easy to spot as they are awash from floor to ceiling with shelf upon shelf of bright pink labelled and coloured products. 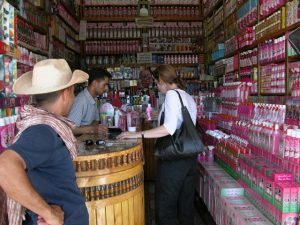 The roses products are extremely popular and are sold locally and distributed all over Morocco and abroad. The rose industry is such an important part of the local culture, community and economy that Kelaa M’Gouna has adopted the rose as its symbol and every May the village holds its Roses Festival. 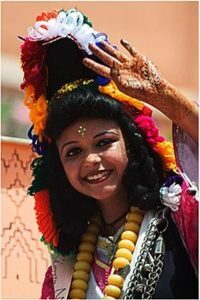 The Roses Festival is held over several days and is a celebration of roses, local Moroccan culture with music, singing and dancing and crowing of one of the local women as the Roses Queen. 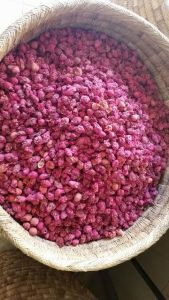 If you join us on one of Berber Treasures Morocco Tours and travel to Morocco ‘s Roses Valley in May you will see roses blooming everywhere, and your timing coincides with the Roses Festival you may be lucky and experience some of the local traditional Moroccan entertainment. The Roses Valley is just one of so many reasons to include a visit the Road of A Thousand Kasbahs in your Morocco travel plans. Many of our Berber Treasures Morocco tours small group tours of Morocco travel through the Roses Valley and along the Road of A Thousand Kasbahs (such as CE1, CE2, CE3, CE10, CE11, and CE12) and of course if you choose to take one of our custom designed private tours of Morocco – your bespoke Morocco tours itinerary can include the Roses Valley and the Road of A Thousand Kasbahs. 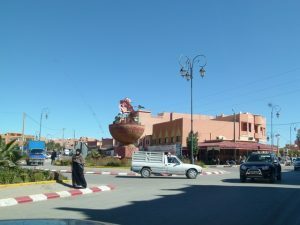 Email or call us now to discuss how best to include the Roses Valley in your Berber Treasures Morocco Tours itinerary.